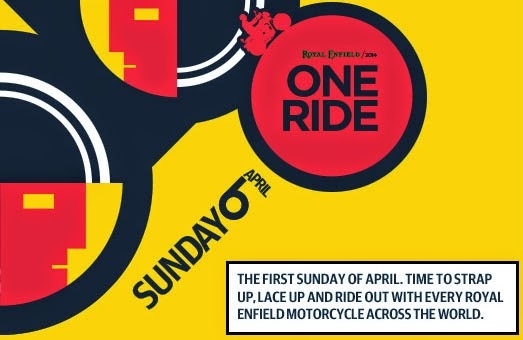 Get out and ride your Royal Enfield this Sunday. This Sunday, April 6, the first Sunday of April, 2014 is international One Ride day. It's time to ride your Royal Enfield motorcycle with ever other Royal Enfield motorcycle in the world. That's up to you. And me. You can find a ride to join, or register your own ride on the official factory website. With no ride planned near me, here in Florida, as far as I can tell, I'm on my own to create a One Ride outing. But I am not the leader of any pack. So I'll be going, but I'll be going it alone. As a commuter, I always rode alone and that's what seems natural to me. I go as fast as I please and I stop when I want to stop, as long as I get to my destination. But what would that destination be? "Why don't you take the motorcycle to church?" my wife suggested. "Find a church on A1A (the beach road) and enjoy the ride." Ummm. Possible. That is a scenic route. But I was hoping for something more exciting; maybe a place for breakfast? Or maybe a historic roadside attraction I've never visited before? Where are you riding this Sunday? Leave a comment. I'm planning to ride out with the boys from Royal Enfield of Fort Worth, but there's also a 90% chance of thundershowers, so the plans are kind of tentative right now. Last year, I rode around the town I've called home for the past 20 years and found miles and miles of road I never knew existed.